"All I can say is thank you, thank you, thank you! My husband said it was the best seafood he had ever eaten. I am not a big seafood fan, but I must say they were both divine! I am going to buy a case of each of the new entrees and sell some back to my co-workers (this way we can try them all). They were a great hit with all of us. I especially love the fact that they are so easy to prepare, it is simply effortless and the best part is the end result, DELICIOUS. To me most seafood (purchased from markets) is just to hard to know what to do with, you have solved that mystery for me. I am nearing 50 years old and one of my goals is to eat more healthfully, I know good seafood is important, I just could not make myself prepare and eat it. You have changed that for me, and I thank you. I am sure you will both be so successful in this endeavor, not just monetarily, you both seem to glow with personal fulfillment." Henry & Lisa's Natural Seafood – Healthy for you and your Planet! All Henry & Lisa's products are sourced exclusively from fisheries that our independent Seafood Advisory Board, comprised of some of the world's leading marine conservation scientists, recommends as the most sustainable on earth. Nurture Your Health, Henry & Lisa's has something for everyone!! 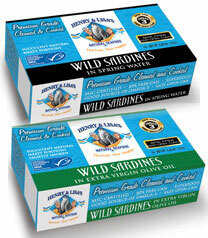 We are thrilled to introduce Wild Sardines from Portugal. Our succulent meaty sardines are caught off the beautiful coast of Portugal in late summer when the fish have fattened up for spawning, utilizing certified sustainable time-honored net fishing techniques. These sleek silvery fish are rapid reproduces and travel in schools in the confluence of the tropical and northern currents off of Portugal creating productive upwelling. They feed near the surface at night on plankton, allowing fishers to easily target their catch and avoid by-catch of other species. Wild Portuguese Sardines come from a MSC certified sustainable fishery. For more information, download our Henry & Lisa's Natural Seafood information sheet. We have expanded our canned seafood line to include a NO SALT ADDED Solid White Albacore Tuna. In addition, we are proud to use only BPA free lined cans. We have been told by many and believe ourselves that this is the world's best tuna in a can. Our fisher friends in the Pacific Northwest catch them in small family boats on hook and line. They deep chill the tuna on-board within minutes, preserving the meat's peak freshness. At the local micro-cannery, only the best part of the loin is used, and the tuna is cooked only once in the can, in its own natural Omega-3 rich oils. Due to this process, and the rich oils of this cold water species, our tuna is five times higher in heart-healthy Omega-3's then most brands. It is also much lower in mercury than most brands, because the tuna we use are smaller. Smaller fish = lower mercury. The bottom line is this is the highest quality, healthiest, most sustainable canned tuna you can buy! 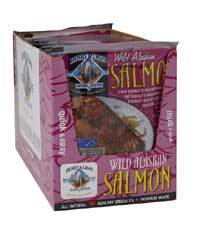 We have two wonderful Wild Alaskan Canned Salmon items. Our original Skinless & Boneless Fillet and our newest item Wild Alaskan Salmon packed the traditional way with the skin and bones. In addition we are proud to use only BPA free lined cans. We have been told by many and believe ourselves that this is best pink salmon in a can. It all starts with the premium grade salmon that our fisher friends in Alaska catch on small family owned net boats. They land the salmon and deep chill it on-board with-in minutes, preserving the meat's peak freshness. Later the same day at the local cannery only the best part of the fish is used, and the salmon is cooked only once it its own Omega-3 rich oils. The original pack uses only fillet meat and the tradtional pack retains the skin and bones. Due to this process and the rich oils of this cold water species our pink salmon is packed with heart-healthy Omega-3. The bottom line is this is the highest quality, healthiest, most sustainable canned salmon you can buy! We all love to cookout so we set out to create a healthy alternative to the traditional hamburger. Our Wild Alaskan Salmon Burgers raise the bar; they are all natural, healthy, packed with heart healthy omega 3's, gluten free, non-GMO and delicious to boot. 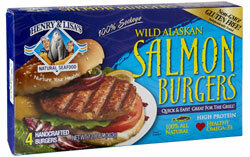 Handcrafted with care from wild Alaskan Salmon, these "burgers" will satisfy even the heartiest appetite. Toss 'em on the grill and you will love the flavor and enjoy knowing that you are supporting small fishing communities in Alaska! The fishstick has evolved!! We set out to create the best fish stick on earth. We think you'll agree that these revolutionary Nuggets are the best tasting and healthiest you've ever eaten - here's why. Our Pollock fillets are frozen on-board boats in the Bering Sea of Alaska within hours of harvest, preserving their peak freshness. We've used minimal breading so you'll get more fish with every bite and naturally there are no trans fats. All our Wild Alaskan Pollock comes from a MSC certified sustainable fishery. Designed with value and choice in mind, EcoFish 5lb. Grab ’n Go box contains 10 – 4 oz. individually vac-pack portions. This provides you with the convenience of purchasing the 2.5lb. box or simply purchasing one or more individual vac-packed 4oz. portions – allowing you to satisfy everyone’s favorite fish desires without any waste or compromise. The Grab ’n Go is conveniently located in your stores freezer. 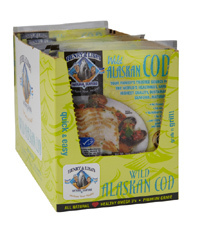 We are thrilled it introduce Grab 'n Go Wild Alaskan Cod. From the pristine Alaskan waters this versatile white fish is the perfect addition to our Grab 'n Go Line. Alaskan Cod has moist, firm fillets, a distinctive large flake and a slightly sweet flavor. It can be baked, poached, steamed, sautéed, or deep-fried for fish and chips. It takes well to many different marinades, sauces and coatings, and is a great source of high quality protein. All our Wild Alaskan Cod comes from a MSC certified sustainable fishery. Henry & Lisa's Natural Shrimp! We are pleased to offer uncooked all natural white shrimp! 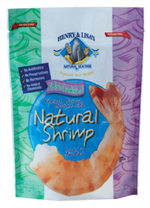 Henry & Lisa's Natural White Shrimp are grown in a state of the art aquaculture facility in Ecuador. The eco-friendly farm utilizes crystal-clear river water direct from the Andes Mountains. Naturally raised according to European organic standards without chemicals, antibiotics, genetic modifications or pollution. Great for shrimp cocktail, salads, pasta dishes or on the grill. We believe you’ll find these shrimp to be the best tasting and healthiest shrimp you will ever eat! EcoFish's retail products are all frozen, because our frozen seafood is fresher than fresh. We lock in peak freshness at the point of catch. Quick frozen with the latest freezing technology and vacuum packed usually within hours of harvest, you can't find better quality seafood. Please see our Seafood Quality page, to learn more our freezing process and about why our seafood is the best available. Some of the nation's top chefs use EcoFish, and what we offer you is cut from the exact same fish — white tablecloth restaurant quality. Some people say our seafood is pricey — we say you get what you pay for. Comparing our seafood to other proteins of high quality (organic or free-range beef, pork, poultry lamb, etc. ), you'll find we are very price competitive. Care about your Health? We do too! Click here to find out more about the health benefits of seafood, and the extra measures EcoFish takes with our Seafood Safe Program. To find a retail store or restaurant near you that carries Henry & Lisa's Natural Seafood, all we need is your email address and zip code. Submit this short form and we will get back to you promptly. 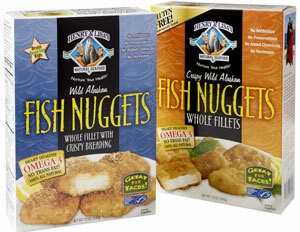 Do you frequent a particular food store and they do not carry Henry & Lisa's Natural Seafood? Maybe they are not aware we even exist and are available to them! Print out these information forms and bring them to the manager at your local store. Let us know you did and we can call them to answer any questions. We love to hear what our customers think! We use all the feedback we receive to put products in the market that you want! Click here to send us a suggestion.